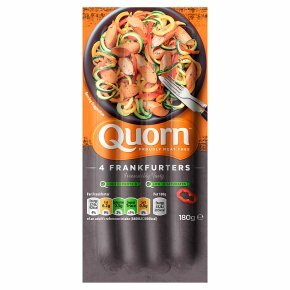 Meat free Frankfurters made with Mycoprotein? Proudly meat free. Satisfyingly simple. High in protein and fibre. Vegetarian Society approved.Create tasty hot dogs, veggie style with Quorn Frankfurters. Great for Kids teatime! A great source of protein, as well as being naturally lower in saturated fat.